Every now and then I like to cruise through my Dress Up, Not Down board on Pinterest and look for some inspiration for dressing for the day. 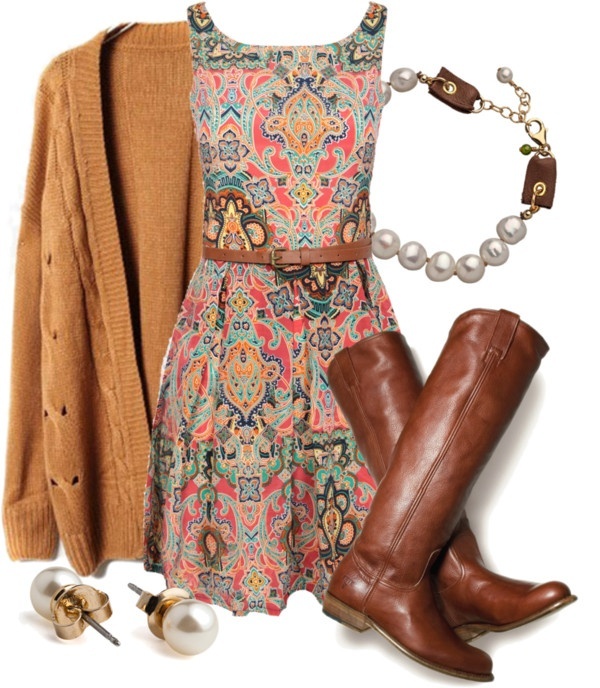 For this outfit, I spotted a great (and in my opinion very versatile) pin from Polyvore that matches a cute dress, cardigan and riding boots. As soon as I looked at the pin I saw this outfit pop into my mind. I have a magic talent for remembering all of the clothing I have and putting pieces together without ever taking them out of my closet. 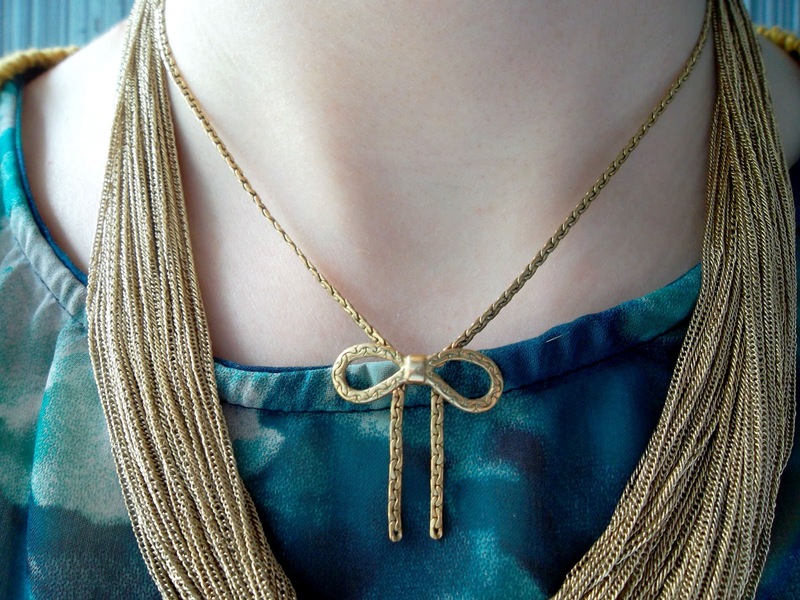 This vintage Avon bow necklace came from Etsy. Here's another one for just a few bucks. I saw this and just had to have it. I love how it rests just at the base of the neck. I think it would be perfect with a button up shirt so I'll have to try that soon! I've been experimenting with what I am calling the "mini beehive". I noticed that when I push a headband back it gives me a tastefully small bump and adds some volume to the hair. I've been adding some hair spray for extra volume and this do held up all day long without any fly-aways. I like it. 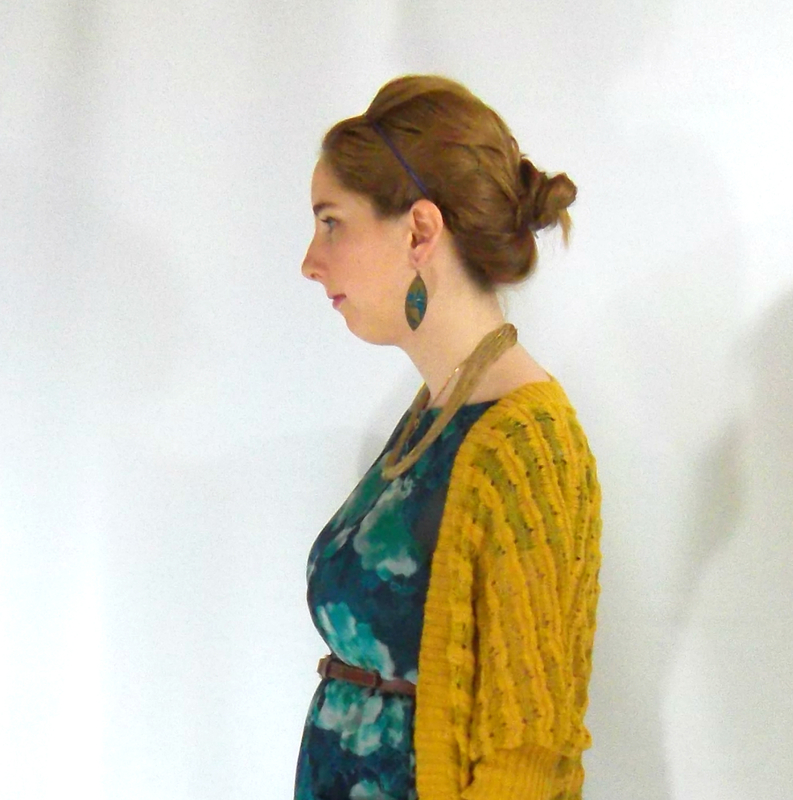 Here's the original outfit I used for inspiration on Pinterest. I love the comfy look of that cardigan, but anything I have that is that heavy is most likely in storage for the summer. 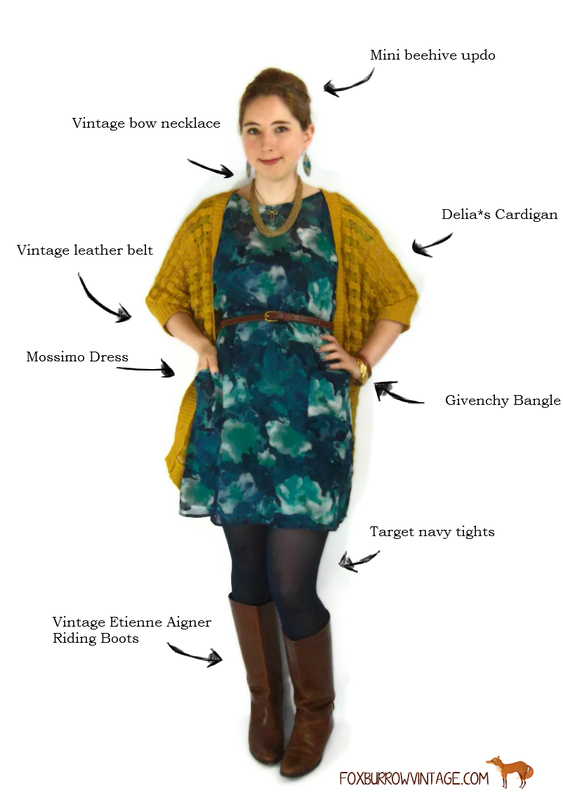 The thing I love most about this outfit is that it's so easily substitute-able. It would match perfectly with any number of vintage dress such as this high-collared polkadot 50s dress or this navy blue and white dress from Tori Richard. It's been really rainy here, but I managed to snap a shot of my garden gnome in his natural habitat. I think he needs a name... Any suggestions? The pink plant is new this year - it's a perennial which is great because it means I have to buy fewer plants year after year. Some exciting news coming up this week... stay tuned!